Does your children love to read? My son loves to read and I’ve made sure he’s kept it up during the summer while school is out. It is so important to have our children read every day and can be such a valuable learning tool. What’s your children’s favorite books? My son is really in to anything related to history or science. When we visited the Kennedy Space Center he selected a few books and has really enjoyed them. In this fast-paced and sometimes overwhelming world, it’s important to teach our children that even the smallest gestures can make the greatest impact. That’s what author Debbie Dunlap, Ed. D truly believes. As an educator for over thirty years, she has passionately taught children to care for others, to be kind, and inclusive. We’ve all heard the horrible stories of childhood bullying that seem to be more apparent than ever. What if you could give your child the tools early on to prevent bullying and soften their hearts to others? Well, with Dunlap & Dunlap Publishing books, written by Debbie herself, you can. She’s written two books to impact the lives of children and encourage them to make a difference and care for others. “What on earth can I do?” touches on the subject of bullying. Based on the kindness of Debbie’s granddaughter, Mackenzie, the book includes the “Mackenzie Pledge”. The “Pledge” is a page at the end of the book that children can sign, personally pledging to stop bullying. This 8 1/2″ X 8 1/2″ book contains 24 pages, beautifully illustrated by Laura Agulto. “Jake’s Journey” is the story of Carly and her beloved bulldog, Jake. As Carly runs to catch the bus, Jake is determined to follow her to school. As Jake pushes open the gate, he begins an exciting adventure and meets some very special people along the way. This delightful story will encourage children to cherish their community and care for others. The 8 1/2″ X 8 1/2″ paperback book is illustrated with wonderful clay characters by Monica Delgado and Lara Agulto and contains 44 pages. Buy it: You can purchase both of these books on the Dunlap & Dunlap Publishing website. They are currently $10 each. 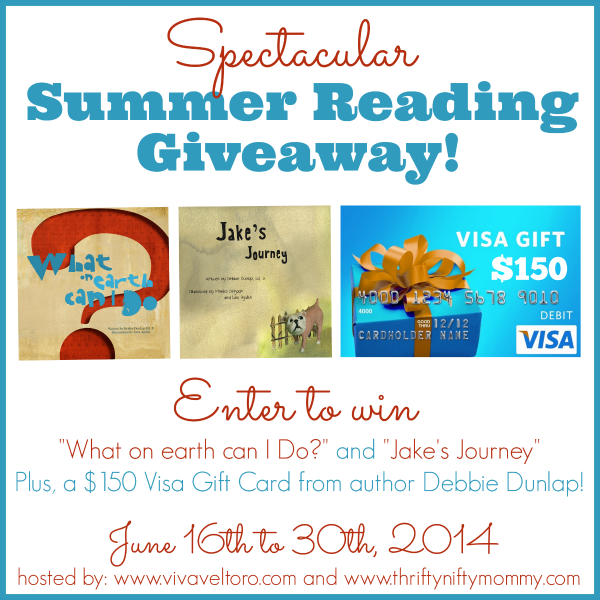 Debbie Dunlap wants to give one lucky person a copy of “What on earth can I Do?” and “Jake’s Journey”, PLUS a $150 Visa Gift Card so they can start their summer off right! Just enter using the Giveaway Tools form below. Open to the US only, ages 18 and up. Ends 6/30/14 at 11:59 PM EDT. Hello! I learned that the theme of her books is on standing up to and stopping bullying. Two of her books are “What Can I Do?” and “Jake’s Journey”. I love this idea. Thank-you for the chance in the giveaway! I learned about the phrase upstander. I learned that she writes children’s books because she thinks that contributing to a child’s language development is important. She and her husband of 37 years developed Dunlap & Dunlap Publishing. I liked seeing that she started her career as a teacher and has helped train teachers in Texas.